Disclaimer: This is NOT a budget build, NOT a mapping build, this build is for min-max bossing. However, if you achieve about 1/3 of the DPS described in this build guide, then you will be able to breeze through all end-game contents, including Shaper, Uber Atziri, Chyula breach, and all T16 Guardians. Hello to everyone who had stumbled upon my Blade Flurry guide. I am sure a lot of you may have gotten tired already of all these Blade Flurry build guides, because all of them are super similar and seem not at all practical (like the damage in the gif above). Many of you may think this damage is only possible in Standard league, well good news, because I am doing this build in Harbinger league. How is my Blade Flurry guide different compare to other guides? Well, not only the concept of my build is easy to understand and the minimum requirement to start this build is super achievable, but also I have my profiles in harbinger league open at all times for you to compare and contrast. And I guarantee you that it is not like other guides that just shows a gif using all mirrored items in standard league, or respec the entire tree and get all the damage nodes in order to capture the very short clip of Shaper fight and uploaded some unrealistic POB gears like 653 pdps Claw lul. Now without further ado, let's dive into this Scion with Hierophant and Raider Blade Flurry build. Daggers in theory have the most damage because of the critical chance implicit and more critical multiplier on skill tree, Claws are safe picks. This league Claws are more expensive compare to daggers though. Swords are fine but I never tested it out, it might work too. 2. What's the minimum budget to start this build? To start this build you will need around 5 ex, however, I feel like the minimum requirement to kill shaper requires about 10 ex (1 6l astral plate, 1 300 pdps dagger, and 1 Taste of Hate). The entire build focuses on the Scion Hierophant class, with the one additional totem summoned, we will be able to use both Ancestral Protector and Ancestral Warchief for the attack and attack speed MORE modifier. The chance to gain power charge is also very nice too. Scion Raider class is also nice because the frenzy charge generation and onslaught. Also Path of ranger is superb as it is close to both Vaal Pact and Winter Spirit. 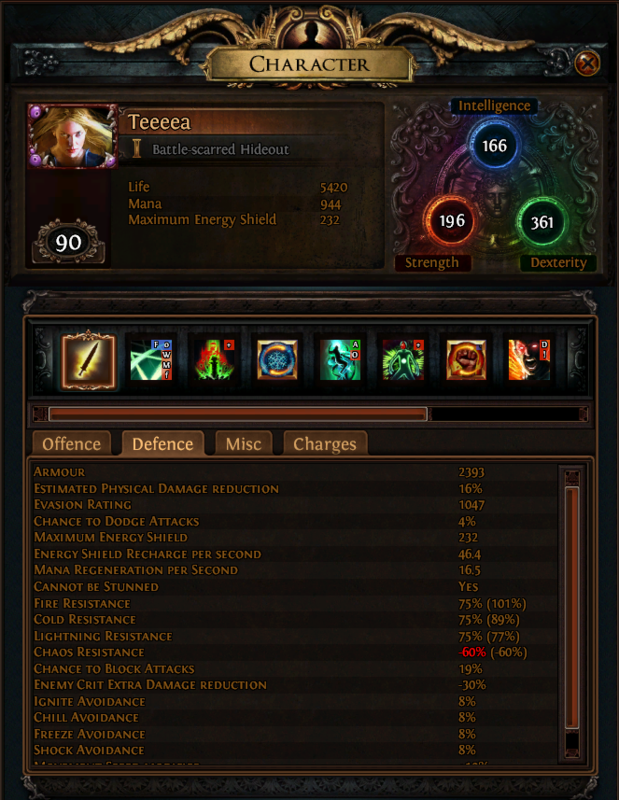 Speaking of Winter Spirit on the skill tree, this build also focuses on elemental conversion. Use a high physical damage weapon (dagger/claw/sword), and equip Moonbender as your off-hand, with Winter Spirit we are able to convert 100% physical damage to 65% cold damage, 25% lightning damage, and 10% physical damage. The reason why we want to convert most (in this case 90%) of the physical damage is because it is easier for us to stack More damage modifier. A pure physical BF build will only benefit on gems such as melee physical damage, maim, and damage on full life. A pure elemental BF would only benefit on elemental focus, elemental damage with attack skills. But if we convert our physical to elemental then all those gems will work at the same time therefore increase the damage tremendously. 1. A rare dagger with 300+ pdps weapon and a good amount of critical chance (can be claw or swords, daggers do the most damage with critical chance and damage, claws are safer with leech, swords are mediocre overall). These four items (corruption or enchantment NOT needed but works really well for the dps increase, which will be shown in later sections) are very essential to our build. 4. 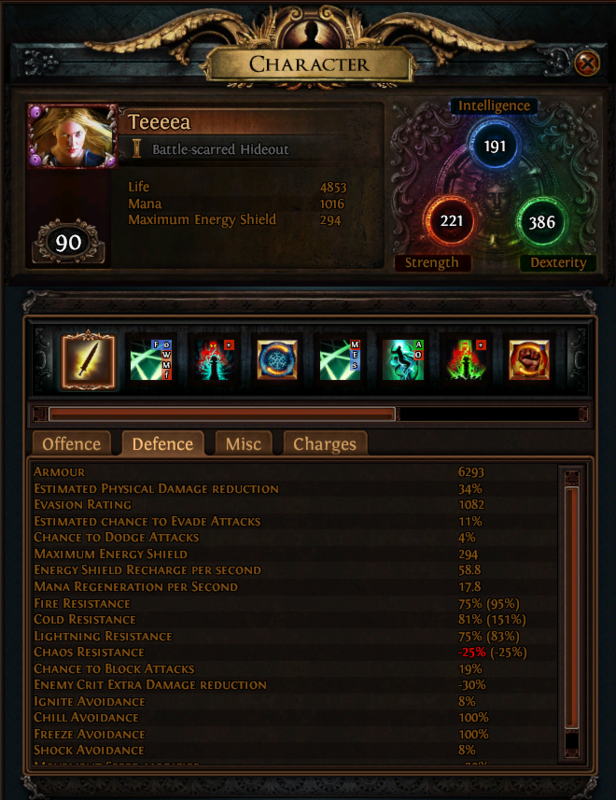 And if you still cannot cap your resistances use a rare belt with elemental damage with attack skills. 1. Culling on Moonbender's, probably the best thing for boss fights, a 11% more damage increase. 3. Helmet enchantment: Ancestral Protector grand increased attack speed enchantment > Ice Golem effect > Blade flurry damage. 4. Elemental weakness corruption Shaper's touch. Use Opal rings if your weapon has APS less than 1.7, and use Steel rings if above 1.7. (Both are good actually, Opal Ring might slightly do a little more damage, use POB to calculate the damage before you spend a ton for rare rings). Use Tabula, Wanderlust, Goldrim, and Dual wield Last Resort from the very start. You can use spectral throw or frost blades to level. Upgrade to rare swords/dagger/claw once they out damage Last Resort, level until level 28 so you can equip BF. BF all the way, keep updating your claws/daggers/swords along the way, you can use claws/swords until you get dagger nodes, or just simply stick to claws/swords. Ascendancy is always a pain for Scion, grab Path of Ranger as soon as possible obviously. Soul of Solaris for bossing, Lunaris for mapping. And of course Soul of Yugul for reflection reduction. Prioritize Crit Multi, Attack speed, and Life. The rest just get Physical damage, area damage, or generic damage. DO NOT get crit chance on jewels. 1. Maim if you feel like you are not on full life the entire time. 3. Bloodlust is fine too if you link chance to bleed with ancestral protectors. Oh man there is just so many fallacies in your argument. 1. It is achievable since I have personally done it in the Harbinger league. There is no need for quotation marks nor misspelling in this case. 2. The guide is yet completed when you posted, there will be video's of me doing Shaper with a 300 pdps dagger. 3. If I put a 300 pdps dagger for 500 ex, will you still link it and claim that's how much that dagger is worth? 4. I am very confused of where the 1000 chaos cost of each jewel comes from, besides the one triple crit multiplier jewel I spent 400 chaos on, the rest of jewels are no more than 50 chaos each, since this league people value life a lot more than a damage stat. But thanks for your attention, really dig it. I like the idea with 2 totems and how you try to do high end builds a little bit alternatively the last few leagues and now. anyway, some points about your build I dislike and so I wouldnt try it. and one question, how do you deal with dmg reflection? Look closely at this guy's clip of the Shaper kill, he lost almost all of his HP taking the first hit from Shaper's laser, meaning that he probably only had 2k hp. He respec the skill tree to get all the damage nodes and just deliberately mislead his guide readers. But I do not want to witch hunt so why would I bother. A. Totems are pretty good for guardians and harbinger farming. Are they absolutely needed? No. Are they helpful? definitely, and power charge generation alone is already pretty attractive for Hierophant node. B. Damage on full life helps tremendously for farming guardians and if Shaper wants to slam me. I guess it is sorta like bloodlust in your guide. I could replace it with blood lust and link totems with chance to bleed. But I honestly do not think it is a huge deal. I use increase AOE and increased critical chance instead of elemental focus and concentrated effect while farming maps. If there is -max res mod I'd just summon my totems to do the dirty work, they have pretty good dps too. Anyways thanks for reading my guide. I was actually somewhat interested in yours but not sure if it were Harbinger or Standard league, judging from your challenge completion I have to assume it is on Standard. of course then, minmaxing a build with ridiculous gear is the only fun left. anyway, I tried to adjust it to harbinger, and the most feedback is pretty neat yet. it is good that there are many ways that lead to Rome, coz during 3.0 beta I thought 3.0 would lack a lot of flexibility. There's always that small amount of Builds that fit into the game and tree like a key, i think you might have just found one. Not even single passive point needs to go to waste due to travelling, beautiful to look at tbh. Thanks, although POB should probably take the credit. But I am still pretty proud of figuring out by using Hierophant ascendancy to massively increase potential DPS. Can you upload a video in Uber Atziri please ... ? ?